Last week we showed you how Leu is learning some of the components of our fun fur seal obstacle course. He's just a little guy so he has a long way to go. But the mature fur seals, that's another story. In this picture you can see one of the svelte female fur seals scaling a speed bump and preparing to go under a limbo bar. Believe it or not, the seals seem to enjoy these physical and mental challenges. 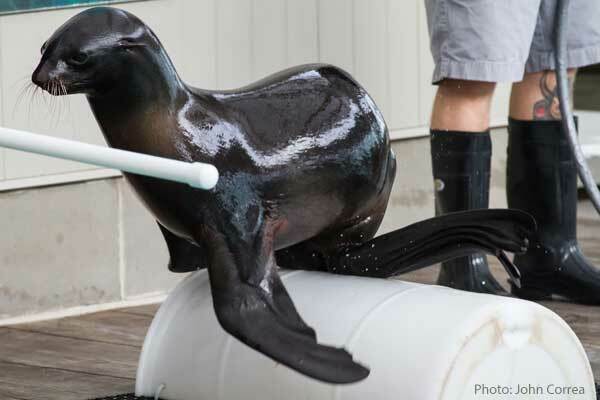 It's all part of keeping our fur seals healthy and happy. After yesterday's Thanksgiving feasts, it's a good day to get active and burn some energy! Go for a walk, throw the football around or even create an obstacle course for you and some friends. If you need some inspiration, check out these obstacle course challenges from when Aquarium staffers took on the fur seals!